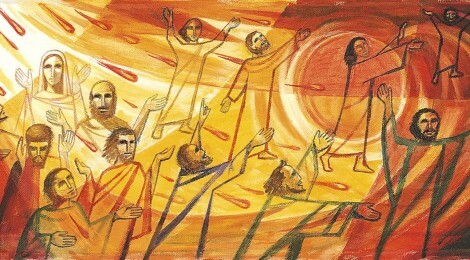 Yesterday was Pentecost Sunday. It was also the day in which our sermon series on Matthew 18 brought us to the issue of having our sin confronted (Matthew 18:15-20). So, a natural question is whether or not there might be a connection between confronting sin and the coming of Pentecost. While these two ideas might seem to be a strange pairing at first, a look at the biblical account indicates that they may be more connected than we would think. In fact, it might be that we have to have one before we can have the other. On the night that Jesus was betrayed the hearts of the disciples were laid open. We see the shocking double-dealing of Judas. We witness the dramatic denial of Peter. And at the Passover meal that took place just hours before Jesus’ arrest the disciples are not only seemingly unconcerned that Jesus has told them that He would be killed (Matthew 16:21), but they are found actually arguing among themselves about which one is the greatest (Luke 22:24). Not that any of this was a surprise to Jesus. He, after all, knew what was in a man (John 2:24). And it should not have been that much of a surprise to the disciples. Jesus had warned them that it would happen. As He put it to Peter, “Simon, Simon, Satan has asked to sift all of you as wheat” (Luke 22:31). The disciples failed Jesus in His toughest hour. He knew they would. Jesus does not ignore their sin. He deals with it. He restores the disciples through a series of appearances and teachings in the days after His resurrection. Then He instructed the disciples to go to Jerusalem and wait for the empowerment of the Holy Spirit. It is interesting to watch Jesus deal with sin and restore His disciples. We observe a powerful scene when we read how Jesus visited Peter on the seashore early in the morning after he and some others had been fishing all night long. Jesus managed to not only restore Peter, but to refocus his mind off of his own failure and onto loving Him by serving others (John 21:15-17). When we turn the page (literally) from this story in our Bible we immediately see Peter standing up boldly on the day of Pentecost and proclaiming the truth about Jesus (Acts 2:14ff). We tend to think of the time that we somberly evaluate our heart as Lent, the weeks leading up to Easter. It is good that we do that. After all, billions of Christians have done so for hundreds of years. And it is a time for us to ponder the suffering of our Lord. However, biblically speaking the disciples were not having their hearts tested, sin confronted, and faith restored in the days leading up to the death of Jesus (Easter). Instead, they were experiencing all of those things in the weeks between Easter and Pentecost. The in-breaking of the Holy Spirit that is marked by Pentecost does not come until our sin has been confronted, until our hearts have been sifted. The real question for us is whether or not we are willing to be confronted. Whether or not we are willing to have our hearts tested. Obviously we all know what we hope the honest answer to that question would be. However, I have to admit that I do not respond very well when confronted by others. Nor have I witnessed very many examples of the way to respond when confronted by others. The truth is that confronting one and another and dealing with sin is messy, no matter how mature one might be. Furthermore, we live in a culture that brings us up to be overly sensitive and defensive to the critiques of others. So, what makes us believe that someone could call out sin in our life and we would magically respond with a positive attitude when we have proven over and over again that we are easily hurt and offended? But don’t get lost analyzing our culture and its effects on our fostering hypersensitivity. The real point is that we have to find a way to stop and ask ourselves honestly whether or not we are willing to turn and face God when He sends someone to confront our sin. If not, there is no point in trying to celebrate Pentecost, because Pentecost does not come until we have turned and allowed our sin to be dealt with.